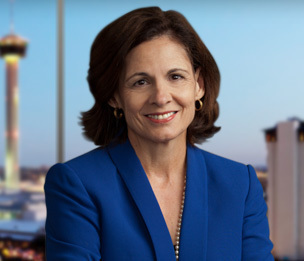 Deborah Williamson serves as the leader of Dykema's Financial Review Committee and has practiced insolvency and restructuring law for over 30 years. Ms. Williamson is regularly called on by clients in a variety of industries for her bankruptcy experience and advice regarding counter-party risk. She served as one of the 19 members of the American Bankruptcy Institute’s (ABI) Bankruptcy Reform Commission. She was the second recipient of the ABI’s Lifetime Achievement Award. Based in San Antonio, she travels frequently around Texas, the United States, and the world to address colleagues and counsel clients on bankruptcy issues and trends. In 2016, Williamson authored the second edition of When Gushers Go Dry, The Essentials of Oil & Gas Bankruptcy to address new realities in the oil fields, the first guide to oil and gas bankruptcy. She had previously co-authored Bankruptcy Litigation for the Commercial Litigator. Ms. Williamson has been named a leader in her field by Chambers USA since 2003, previously selected for inclusion by Texas Super Lawyers as one of the Top 100 Lawyers in Texas (regardless of practice), as one of the Top 50 Women Lawyers in Texas and she has been named as one of the Top 50 Lawyers in Central Texas since the honor’s inception. Named one of The Best Lawyers in America© consecutively for over two decades. She has served as Co-Chair of the Bankruptcy and Insolvency Litigation Committee of the Litigation Section of the American Bar Association and Chair of the SBOT Bankruptcy Law Section. Ms. Williamson formerly served as Managing Director of Cox Smith prior to its combination with Dykema and was responsible for guiding and shaping the firm's business and client service strategies. TXCO Resources Inc. v Peregrine Petroleum, LLC, Adversary Case No. 09-05125-rbk, the United States Bankruptcy Court for the Western District of Texas, San Antonio Division. Trial counsel to post confirmation TXCO Resources, Inc., a publicly traded exploration and production (E&P) company in successful prosecution of trade secret misappropriation claims against Peregrine Petroleum, LLC. Following a 41-day trial, the Court awarded judgment in favor of RTXCO (Reorganized through Chapter 11) on its claims for misappropriation of trade secrets and entered a multi-million dollar damage award. Lead counsel to an exploration and production company who were Debtors in jointly administered chapter 11 bankruptcy case. Dykema began to assist TXCO’s management in negotiations with their lenders beginning in March 2009. Once a commitment for post-petition financing was obtained in an amount sufficient to avoid the need for immediate liquidation, Chapter 11 was filed on May 17, 2009. Dykema played an instrumental role throughout the bankruptcy case, including obtaining approval of the $32,000,000 in debtor-in-possession financing over numerous objections, putting in place a sale process, introducing potential purchasers, and ultimately negotiating the terms of a sale for approximately $310,000,000 of significantly all of the assets of debtors, which provided for the payment in full of the creditors’ claims with interest and a multi-million dollar return to equity. Counsel to a member of the Official Committee of Unsecured Creditors. Creditors’ Committee counsel in the Fort Worth bankruptcy cases of an international generator and marketer of electricity. We represented a multi-national maintenance, repair and overhaul company in connection with its claims against Aloha Airlines. We represented MBIA Insurance Corporation (“MBIA”) in connection with the default, foreclosure and chapter 7 bankruptcy of the last osteopathic hospital in the state of Texas. MBIA was the insurer of over $70,000,000 in unsecured bond obligations. This case involved issues related to the bankruptcy of a not-for-profit corporation and related for-profit affiliates, some of whom were co-debtors. Other issues included potential liability of former officers, directors and advisors to the not-for-profit corporations and analysis of potential claims, and defense of a third party claim brought against MBIA ultimately resulting in a dismissal of the claims against MBIA. Representation of a multi-state nursing and assisted living company in connection with its re-structuring of secured obligations. The Firm was counsel to the secured lender, Webster Business Credit Corp. Counsel to a Chapter 11 trustee, a non-bank trustee, of an Austin-based e-commerce company and multi-state mortgage originator. Representation of a Chapter 11 bankruptcy estate in sale and licensing of intellectual property assets. Creditors’ Committee counsel in the Austin bankruptcy case of the parent company of multi-national restaurant chains. Liquidating Trustee and Creditors’ Committee counsel in AgriBioTech, Inc., a Las Vegas bankruptcy case of an international developer and distributor of turf and forage seeds. Debtor’s counsel for Avado Brands, Inc. in the Dallas case of two multi-state restaurant chains. Debtor’s counsel for a multi-state pharmacy franchisee in a pre-packaged bankruptcy. We represented the post-confirmation Investment Oversight Board (“IOB”) which consisted of Mexican investors. We advised the IOB with regard to the pursuit of claims and causes of action. The Firm represented Colina Del Rio, LP in connection with its role as an assignee of a non-recourse note secured by an uncompleted, multi-million dollar, mixed-use development property. Issues involved liability of assignee for alleged claims and causes of action asserted against the original holder of the note in connection with construction of property, including the ability to offset, prohibit or limit rights of secured creditor’s credit bid and opposition to attempts by the secured lender to foreclose the property. Representation included defending an appeal to the Fifth Circuit on an issue of first impression. Villaje Del Rio, Ltd. v. Colina Del Rio, LP (In re Villaje Del Rio, Ltd.), 283 Fed.Appx. 263 (5th Cir. June 25, 2008). We were lead counsel in the representation of the Chapter 11 Trustee, Ford Elsaesser in the case of Joseph Milanowski. Mr. Milanowski was a principal in three entities which brokered commercial mortgages and/or acquired commercial properties around the United States. Contingent and liquidated liabilities exceeded $300,000,000. Creditors’ Committee counsel in the Corpus Christi bankruptcy case of an international distributor of rice. Our client, a Singapore-based aviation maintenance company, acquired leasehold interests and assets out of a bankruptcy estate. We assisted our clients in the initial bid proposal, negotiation through auction and closing of this transaction. We also guided our client through the complex regulatory and national-security related requirements. We assisted our client, an international telecommunications/media company, in its acquisition of certain assets from a financially distressed national retailer of computer equipment and software used in its computer services division. We worked closely with company counsel to evaluate insolvency risk and structure the transaction to reduce the risk to our client. Lead counsel for the Buyers in the acquisition of the various assets, including a commuter aircraft manufacturer and airline maintenance, repair and overhaul facility. Our client was the purchaser of a hospital in El Paso. Professional fee examiner in El Paso Refinery. Plan Mediator for Cordillera, a golf resort and development in Colorado. Legal and Business Developments in E&P Cases, American Bankruptcy Institute 2017 Annual Spring Meeting, Washington, D.C.
Deborah Williamson Interviewed by Texas Lawyer on "The Future of the Legal Profession." Managing Director of Cox Smith named to Advisory Board of international alliance of independent law firms. Kathleen Walker Named Top Immigration Attorney, Deborah Williamson Honored in Texas Lawyer’s "Go-To Guide"